Rules Solve as a regular slitherlink. In addition, any two connected straight line segments must have different lengths. This entry was posted in Puzzles and tagged gp, review, slitherlink, unequal lengths, variant on 2019-04-20 by rob. And quickly another post to hide that terrible Domino Construction. 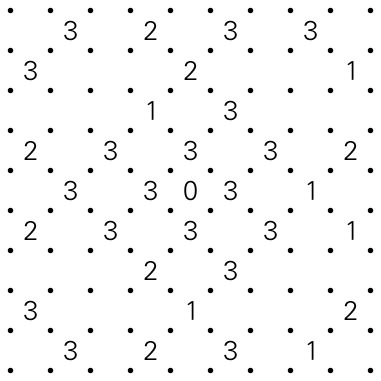 In contrast, this one has a nice solving path, but will you find it? Rules Solve as a standard Slither Link. In addition, all cells outside the loop must be connected, and there must be no 2×2-square of cells that is entirely inside or outside the loop. This entry was posted in Puzzles and tagged hard, hybrid, preview, puzzle, slitherlink, yin-yang on 2016-08-04 by rob. The next GP round is coming up, with the Russian GP authored by Andrey Bogdanov. One of the types is Yin-Yang Fences, which I first saw on Andrey and Vladimir’s round for the Budapest 24 hours this year. You should be able to find these here. Berni made another for our croco 24h review series. You can leave out one of the 2s on the outside if you want more of a challenge. This entry was posted in Puzzles and tagged hybrid, medium, preview, puzzle, slitherlink, yin-yang on 2016-08-01 by rob. Next Keller puzzle. Some of the logic may have been lost in completing the domino part for this one. 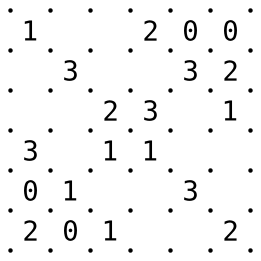 I find the restrictions that the compatible domino tiling imposes on the loop to be quite interesting in this type, the interaction with the domino puzzle as such less so. Rules The left grid is a domino dissection puzzle. 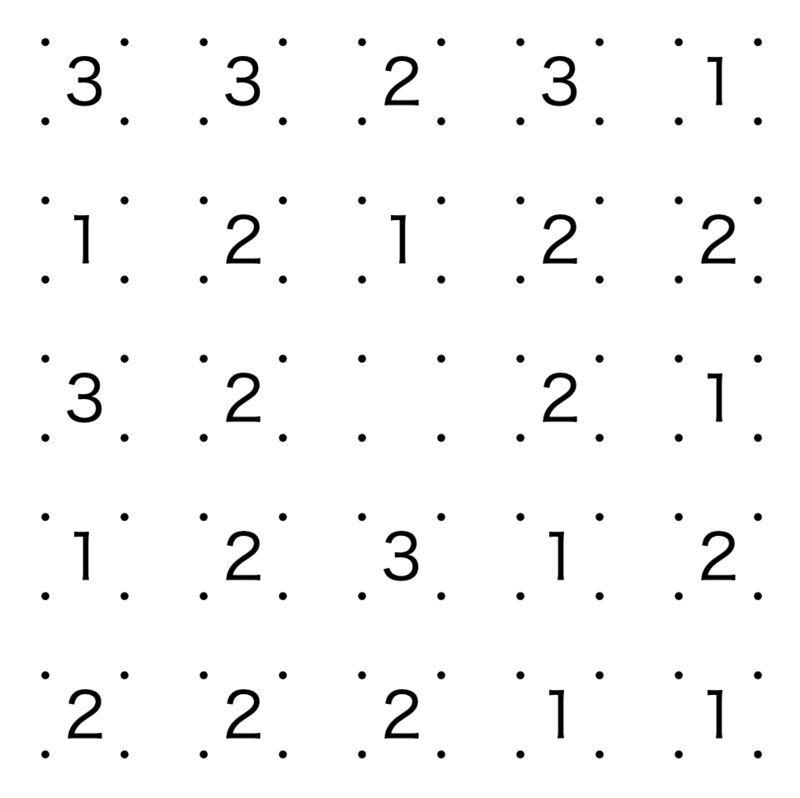 Divide the grid into 2×1-areas such that each domino occurs exactly once. 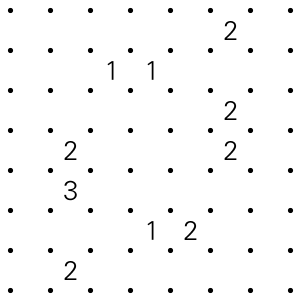 The right grid is a standard fences/slitherlink. The grids interact: Superimposed over the solved domino grid, the fence can’t bisect a domino. This entry was posted in Puzzles and tagged domino, hybrid, keller, medium, slitherlink on 2016-06-22 by rob. As a bit of a breather before posting more JaTaHoKus, here’s a puzzle for one of the new types, at least I hadn’t seen it before. It was on the mixed round of the Logic Masters. It’s an “edge and corner fences”. 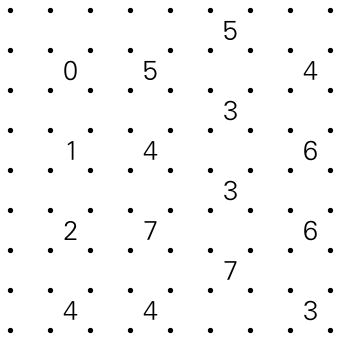 Rules Draw a single loop consisting of vertical and horizontal segments between dots that does not touch or cross itself. 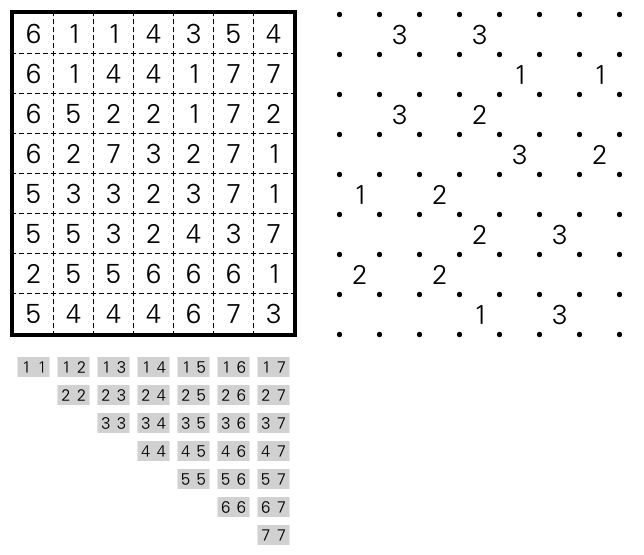 Clue numbers indicate the number of adjacent edges and corners that are used by the loop. This entry was posted in Puzzles and tagged ecken-und-kanten-rundweg, medium, slitherlink, variant on 2016-06-15 by rob. Here’s a practice puzzle for the other non-standard type on the Serbian GP this weekend, “Slitherlink Out-Liars” as they call it. I’m not too sure this one is representative of the type; certainly it feels different than the others I’ve solved. 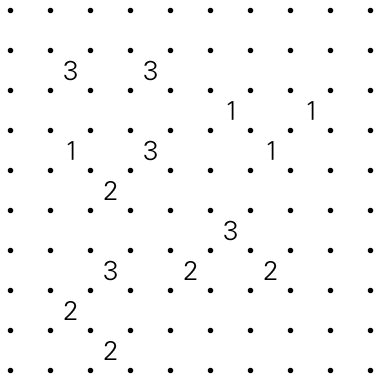 Rules Draw a single loop that doesn’t touch or cross itself by connecting dots horizontally and vertically. Clues inside the loop indicate the number of adjacent edges used by the loop. Clues outside the loop indicate the number of adjacent edges used by the loop, plus or minus 1. Or see the instruction booklet. Some more puzzles: 2010 German qualification. On croco puzzle: 2013-12-21, 2014-02-08, 2014-04-26. There was also one in the 2014 WPC. This entry was posted in Puzzles and tagged außen-knapp-daneben, hard, practice, slitherlink, variant on 2015-01-14 by rob.